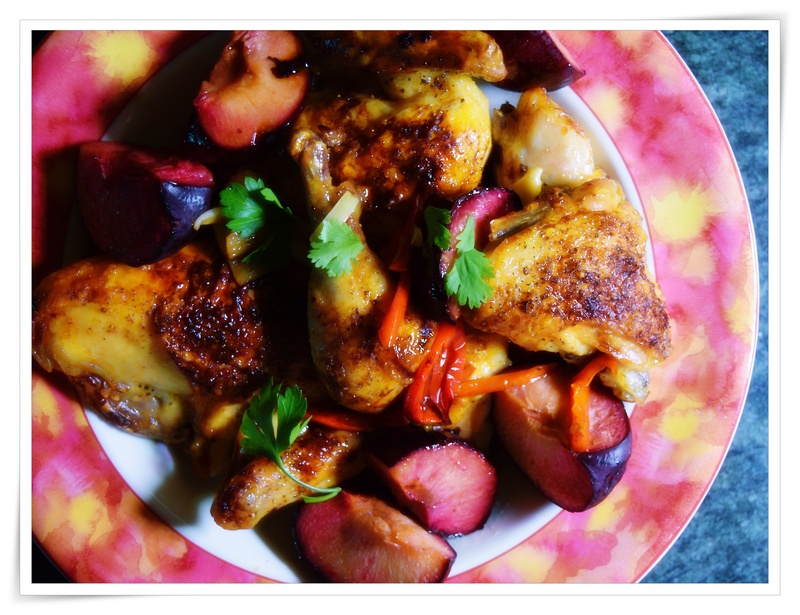 Pot Luck with Hugh Fearnley Whittingstall…I think that I’ve run the gamut of “chicken with” some kind of fruit, but haven’t made anything with plums lately so it was time to use the last of the plums on the counter. Hugh Fearnley Whittingstall has a good book out, Three Good Things…on a plate that I am enjoying cooking from and most of the recipes are quite easy and ready for the table in under an hour. So while there was interesting mix of ingredients, I didn’t find it as good as many other chicken with fruit dishes, but certainly good enough and I’m not sure that the plums were the best kind for the dish, but I’ll try it once again with our local plums when in season or consider Hugh’s suggestion use the apricots and plums from the packages. I think that a combination of dried fruits would work as well. Serve with a savory version of couscous or quinoa. Preheat the oven to 375. Put the chicken thighs or chicken pieces in a roasting pan, drizzle with EVOO and season well with salt and pepper. Roast for 30 minutes, turning once or twice. Meanwhile, halve and remove seeds of the chili, if using, then cut each into thin strips. After 30 minutes, take the chicken out of the oven and add the sliced chilis, garlic and ginger to the roasting tray. Turn the chicken again to make sure the aromatics are evenly distributed around and under the pieces. Serve with noodles or plain rice. SWAPS: you could use prunes or dried apricots (ideally the plump, ready-to eat ones) instead of fresh plums. Fearnley-Whittingstall, Hugh (2012-10-11). Hugh’s Three Good Things (Kindle Locations 3152-3157). Bloomsbury Publishing. Kindle Edition.